The picture shows two (upright) 7mm F connectors and you can see the "O" rings inside. A couple of spare "O" rings are also in the picture just to show what the "O" rings look like. 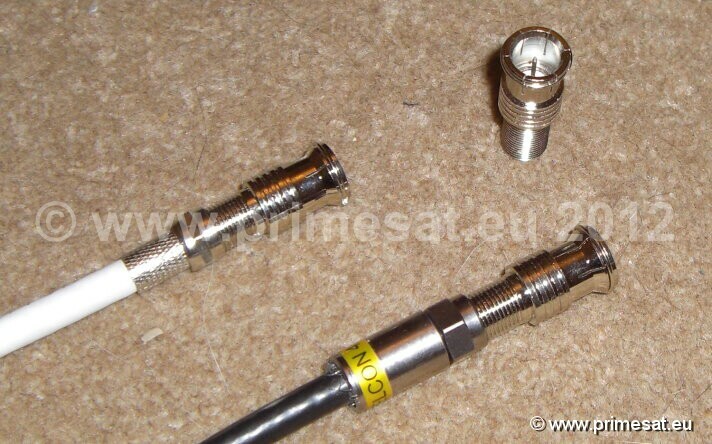 Also shown (laid down) is our heavier connector on the left and a typical low cost F connector (found on many UK sites) on the right. Notice how our 7mm F connector with"O" ring has a larger, heavier nut. Indeed the whole connector is larger and heavier. 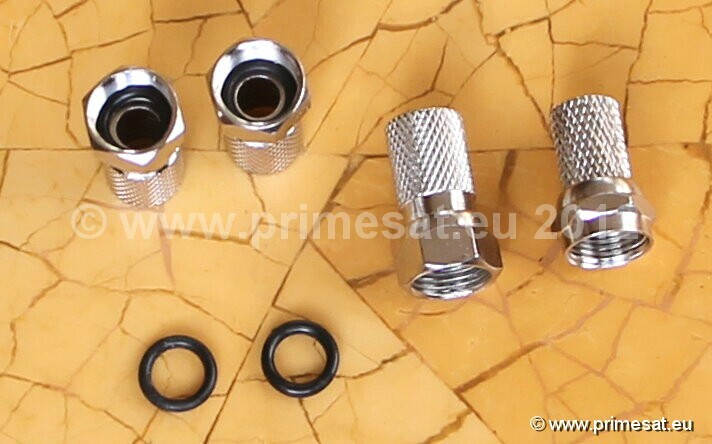 These are high quality connectors sourced from Germany. This 7mm F connector fits all of our high quality 7mm cables. 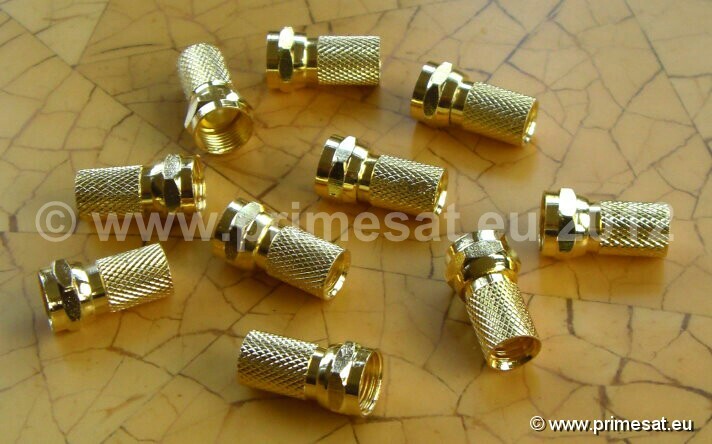 Gold plated F connectors have a finish that provides a better electrical connection and is longer lasting. Converts a normal F connector to a push fit F connector. 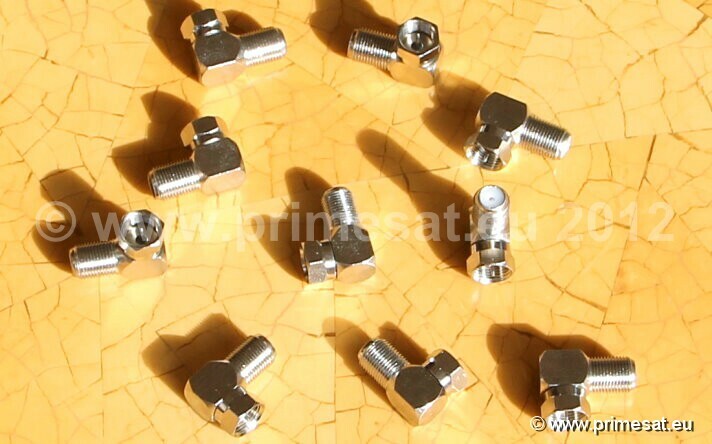 Push fit F connectors adaptors are designed to push on quickly and remove quickly in situations where the cableis going to be disconnected on a frequent basis. E.G. a test bench, a caravan dish cable, a satellite meter lead, etc. In the picture you can see the fast fit F connector adaptor fitted to both a compression F connector and a screw-on F connector. Right Angle F connector adaptor. Converts a normal F connector to a right angle F connector. Ideal if space is limited behind a satellite receiver and the wires need to exit sideways.